Afghan archaeologists say they are racing against time to salvage a major 7th Century religious site unearthed along the famous Silk Road. They have warned that the 2,600-year-old Buddhist monastery will be largely destroyed once work at a mine begins. A Chinese company is eager to develop what they say is the world's second-biggest unexploited copper mine which lies beneath the ruins at the site. 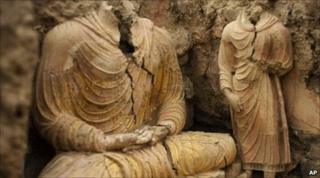 The site is located at Mes Aynak, in the eastern province of Logar. Archaeologists fear that the monastery - complete with domed shrines known as stupas - will probably be largely destroyed once work at the mine begins. Correspondents say that the mine is the centrepiece of China's drive to invest in Afghanistan, as Kabul tries to re-energise an economy still blighted by the ongoing war. Beijing's $3.5bn ($2.2bn) stake in the mine is believed to be one of the largest foreign investments in Afghanistan by far and means that China has a head start when it comes to negotiating future deals to exploit the country's largely untapped mineral wealth, including iron, gold and cobalt. Correspondents say that the Afghan government stands to reap a potential $1.2bn (£755m) a year in revenue from the mine, as well as create much-needed jobs. The ruins were discovered as labourers excavated the site on behalf of the Chinese government-backed China Metallurgical Group Corp (MGC). Hanging over the discovery, correspondents say, is the memory of the Buddhas of Bamiyan - Buddhist statues towering up to 180ft (54.86m) high in central Afghanistan that were dynamited in 2001 by the Taliban, who considered them symbols of paganism. Because no-one wants to be blamed for similarly razing history at Mes Aynak, an informal understanding between MGC and the Afghan government was reached which initially gave archaeologists three years for a salvage excavation. But the archaeologists say they are now under pressure to reduce that deadline before the end of 2010 - which will not be enough time for the relics to be fully preserved. "The site is so massive that it's easily a 10-year campaign of archaeology," US archaeologist Laura Tedesco told the Associated Press news agency. "Three years may be just enough time only to document what's here." Another archaeologist told AP that the salvage effort was piecemeal and "minimal", held back by lack of funds and personnel. About 15 Afghan archaeologists, three French advisers and 24 labourers are working at the site - a far smaller team than is normally needed. The monastery complex has been dug out, revealing hallways and rooms decorated with frescoes and filled with clay and stone statues of standing and reclining Buddhas, some as high as 10ft (3m). More than 150 statues have been found so far.